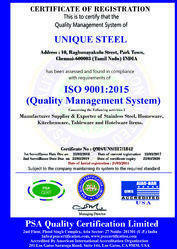 Unique Steel an ISO 9001:2008 company is amongst the finest manufacturers, suppliers and exporters of a wide and impeccable range of Steel Utensils, ever since our beginning of operations in the year 1978. Highly asked for and acclaimed products like Premium Stainless Steel Lunch Box, Food Carrier and Canister Jar, makes up this highly commendable range. Manufacturing of this range is done in compliance with the set industry norms and guidelines, utilizing the finest raw materials and modern machines. Because of this, the offered range is known to have a fine finishing, dimensional accuracy, superior sturdiness, durability and high resistance to corrosion. In addition, for maximum client satisfaction, we mark the offered products at the best rate possible. The ultra modernistic infrastructural facility we have at Unique Steel, has been equipped with all the necessary machinery and equipment, required for the attainment of several of the firms goals and objectives. The facility upgraded regularly, help us in the maintaining and maximizing of the firm’s market standing. The facility has been divided into a number of highly operational units, for reasons of managing the firm’s operations in the best possible manner. These units are governed by highly skilled experienced professionals of ours, work in the most united and dedicated manner, to attain greater productivity. In addition, our ethical working habits have attracted a highly reputed client towards us. With their superior managerial skills, ability to foresee market changes and make commendable decisions, Mr. Tushar Agarwal and Mr. Manohar Lal J. Jain the managing partners, has lead the firm to greater heights in our success. 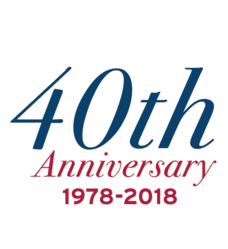 In addition, for betterment of the firm, we provide regular training to our employees and upgrade the infrastructures on a highly regular basis. We are exporting our products in all over the world. Manufacturing and Trading of premium Lunch Box, Food Carrier, Dry Fruit Gift Box and many more. We are known in the market to be a highly quality centric firm. Manufacturing of this offered range is done in compliance with the set industry norms and guidelines, utilizing the finest raw materials and modern machines. Owing to this, the product sturdiness, durability, resistance to corrosion, dimensional accuracy and finishing is widely acclaimed. In addition, the products are sent for several rounds of quality examinations, where they are closely examined and all manufacturing defects are eliminated with superior precision. The highly advanced state-of-the-art infrastructural facility at Unique Steel, is known to be laced with all the required machinery and equipment, required for the attainment of several of the firm’s goals and objectives. For managing the operations in the smoothest and the most efficient possible manner, we have parted the facility into a number of units. These units work in a united manner, to attain greater productivity and standardized quality. In addition, the facility is regularly upgraded, for maximizing our reach in the market. 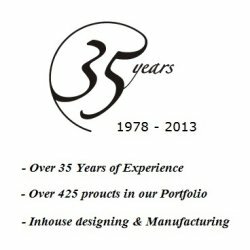 At Unique Steel, we have a team of highly reputed and skilled experts. These experts recruited based on their ability and willingness to work, are amongst the finest in the industry. For the purpose of keeping their knowledge, skills and techniques updated, the team is provided with regular training sessions. For the purpose of managing this team in the most efficient and smooth manner, the team has been parted into a number of units. These highly operational units, under the governance of skilled professionals, work in a united manner, to maximize the firm’s production capacity. ISO 9001:2015 is a series of standards, developed by the International Organization for Standardization (ISO), that define, establish and maintain an effective quality assurance system for manufacturing industries. We are known to be one of the finest manufacturers, suppliers and exporters of a wide and impeccable range of Steel Utensils. Manufactured in compliance with the set industry norms and guidelines, its quality never deteriorates. The utilization of quality raw materials and modern machines gives the product superior sturdiness, durability, resistance to corrosion and dimensional accuracy. For reasons of quality, the offered range is sent to our team of quality experts, who with high precision, eliminates defects. Further, the product’s commendable packaging, timely deliver and reasonable pricing, makes us one of the primary choices. ISO 18001:2007 occupational health and safety management system (OHSMS) promotes a safe and healthy working environment by providing a framework that helps organizations to consistently identify and control health and safety risks; reduce the potential for accidents; aid legislative compliance; and improve overall performance, it’s the world’s most recognized occupational health and safety management systems standard.